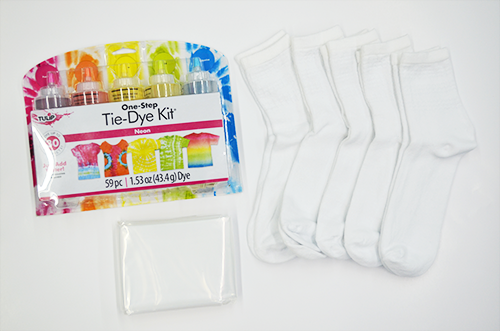 I know it's still winter in a lot of places (sorry, East coast), but one sure way to hurry up spring and summer is to make yourself a pair of one-of-a-kind tie dye socks using Tulip One-Step Tie-Dye! If these socks don't SCREAM warmer weather, I don't know what does! 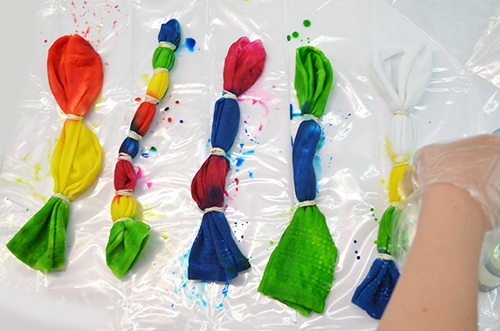 Here's how you can create your own vibrant pair for every day of the week!!!! Inside the package, you will find rubber bands. Wrap your socks as desired with the rubber bands. As you can see, I didn't have much a rhyme or reason. In the words of Bobby Brown, "That's My Prerogative". ...then I wrung them out in the sink. 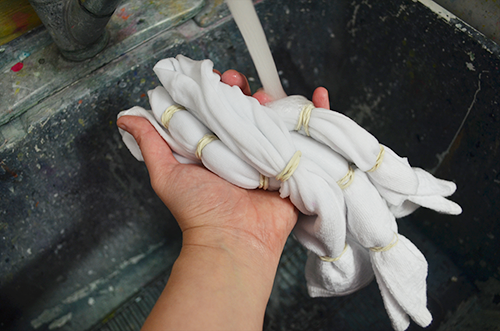 Getting the socks wet helps the dye sink into the fibers! 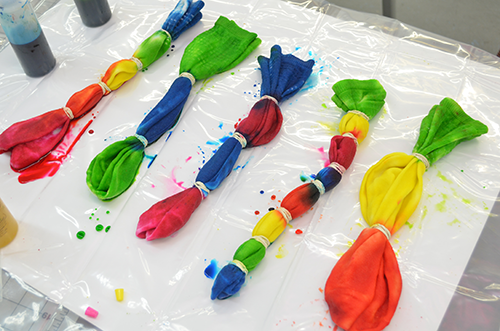 Mix up your dyes and shake them well to dissolve all the powders! I used color water to mix mine. Now the fun part!!! Dyeing!!! 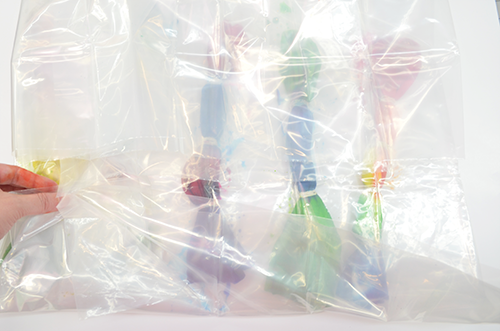 Lay out your surface cover to protect your work surface and go to town, saturating your socks well with the dye! I wanted a lot of vibrant colors colliding on my socks. 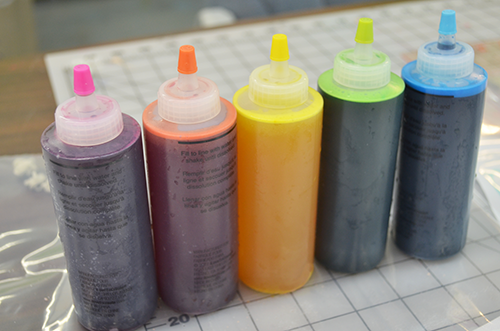 I did opt for colors in color wheel order...from experience orange next to green dye produces brown. That was not a color combo I wanted on my socks! Here's the socks in all their glory! I just knew they were going to turn out fab! Picky crafter tip: If you are super concerned about your colors mixing, use a cooling rack! 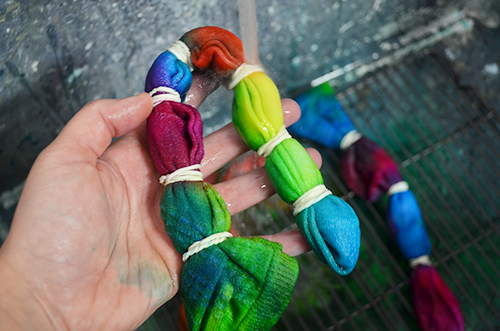 A cooling rack will keep the socks elevated, while the dye colors drip below. 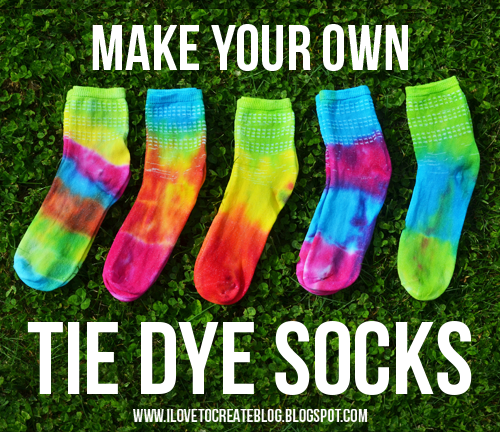 This way the dye colors won't roll around and accidentally seep onto your other socks. I'm not super picky, so I didn't mind if the colors bled off onto the other socks! 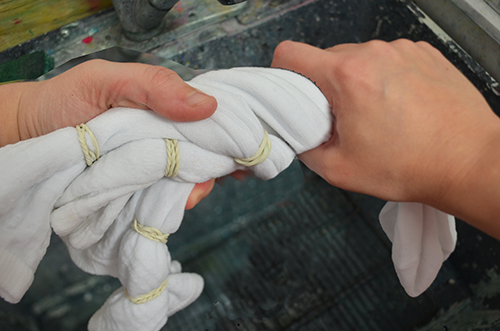 Now fold over the surface cover and let your socks sit 6-8 hours or overnight. This way, you colors will stay ultra vibrant and strong! 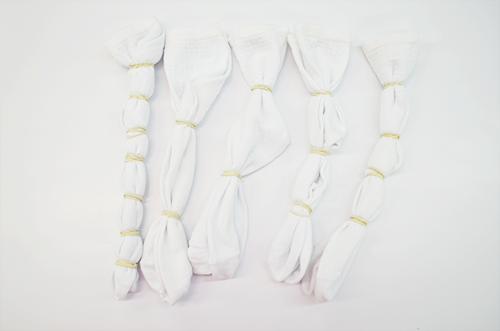 Remove the socks from the plastic wrap and rinse out the dye from each pair of socks. Keep rinsing the socks until the the water from the socks runs clear. Remove the rubber bands from the socks and wash the socks in the washing machine on cold. Add a little detergent to the cycle. Line dry the socks or put them in the dryer. You may want to wash your tie dye socks separately from your other clothes, just to be on the safe side. You wouldn't want there to still be a trace of dye that got off on your other clothes! And here's the finished result! I love how they turned out!!! So vibrant and fun. You may notice that there's some white areas on the socks. That is the elastic (plastic) that doesn't retail the dye! Even though this part did not dye, I still think they are really cool...I think it actually makes the socks more interesting! Which pair do you think looks the coolest??? You dye both socks of a pair together, right? I have really liked the idea of dyeing socks. You have done a great work by telling all in detail that how we change white socks in colors. Now I will definitely try this because I have many white socks of school time. I don't wear those socks due to white color but now they can become useful by following your idea. i like the top pair in the top picture, which i think is the 2nd pair in the bottom picture best. but they're all adorable! I'm so happy you did an easy-to-follow-tutorial for this! I can't wait to make one for my daughter! Thanks so much! 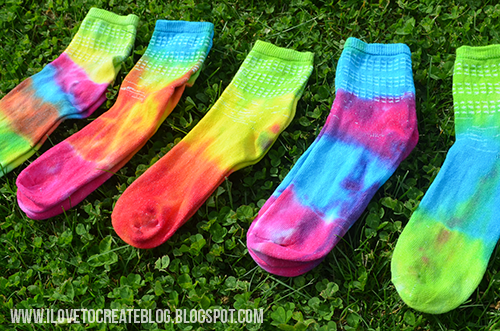 Love this tie dye socks makingDIY tutorial. Thanks for sharing. I don't know that dye socks can be so simple and very good experience. I use thick socks too. I buy the white Columbia brand socks at Marshalls. If these are not thick enough for you, go to Sports Authority, Sports Chalet or Rei sporting goods and look for those really thick winter socks. They carry all kinds. Beautiful socks, beautifully matched colors, DIY creations, look forward to more and better work, greetings from Kislly.com! I also looking for blank white coffee mugs. Hopefully the company is located in Southern California so I can the quality of the mug. AWESOME SOCKS!!! You stated " Mix up your dyes and shake them well to dissolve all the powders! I used color water to mix mine" My question is what is color water? My name is Cindy from Canada, I want to quickly tell the world that there is a real on line spell caster that is powerful and genuine, His name is Dr Ade He helped me recently to reunite my relationship with my husband who left me, When i contacted Dr Ade he cast a love spell for me, and my husband who said he doesn't have anything to do with me again called me and started begging me to come back. he is back now with so much love and care. today i am glad to let you all know that this spell caster have the powers to restore broken relationship back. because i am now happy with my husband. To anyone who is reading this article and needs any help, Dr can also offer any type of help like, Curing of all types of Diseases, Court Cases, Pregnancy Spell, Spiritual protection and lot's more. You can contact him Via his email adespelltemplehome@gmail.com call or add him on whats app with his phone number +1(412)405-1961.